The newly installed Littlefield Gateway in 1933, with the old Main Building in the background. This campus scene was a short-lived one. A year later, Old Main was razed to complete the current Main Building and Tower. Click on the image for a larger view. It’s a long-standing question frequently heard on the Forty Acres: why is a statue of Jefferson Davis on our campus, and placed next to, of all people, Woodrow Wilson? The fountain and statues on the South Mall – collectively known as the Littlefield Gateway – have been praised and condemned since they were installed in the early 1930s. Their presence is the result of an extended conflict between two very different University regents who, by chance, had the same first and middle names: George Washington Littlefield and George Washington Brackenridge. Born in Mississippi in 1842, George Littlefield moved to Texas when he was six years old, and grew to cherish his Southern ancestry. He defended the Confederacy during the Civil War, rose to the rank of Major, and then returned to Texas to make a fortune in the cattle business with ranches in West Texas and New Mexico. He arrived in Austin in the 1880s and founded the American National Bank, which was eventually housed in the Littlefield Building that still stands at Sixth Street and Congress Avenue. Late in his life, Littlefield became a regent and benefactor to the University. Brackenridge was a decade older than Littlefield, was born and raised in Indiana, and had attended Hanover College, Indiana University, and Harvard University. When Brackenridge was 21-years old, his family moved to southeast Texas, and he became a surveyor in Jackson County. But at the outset of the Civil War, while his three older brothers enlisted in the Confederate Army, Brackenridge became both a Union sympathizer and war profiteer, and smuggled cotton through Brownsville and around the Union blockade along the Gulf Coast to New York. After the war, he moved to San Antonio, founded a bank of his own, and ran the city water works. Brackenridge was appointed early on to the UT Board of Regents, and served for a record 27 years. The idea was popular with Austinites. Local newspapers printed cartoons of UT students jumping out of classroom windows for a quick swim in the Colorado. But Littlefield, whose mansion (photo at left) was just across the street from the University, would have none of a “Brackenridge campus,” and searched for ways to prevent a migration. The need of a larger campus resurfaced in 1919, after the conclusion of World War I. Veterans returned from the trenches in Europe to fill universities across the country, Texas among them. Relocating the University to larger quarters was again discussed. To head off a potential move, Littlefield contacted Pompeo Coppini, an Italian-born sculptor living in San Antonio. Littlefield proposed to build an arch at the South entrance of the University to serve as a gateway to the campus. On it would be figures important to Texas and Southern history. While it was a memorial in appearance, it was also another nail intended to secure the campus from moving to the Brackenridge Tract. Coppini built a model of the arch that was featured in an exhibition in Chicago, but the sculptor informed Littlefield that its construction would cost more than the $250,000 Littlefield was willing to spend. Coppini offered the idea of a fountain instead, and at the same advised against a memorial to the Confederacy. “As time goes by,” Coppini argued, “they will look to the Civil War as a blot on the pages of American history, and the Littlefield Memorial will be resented as keeping up the hatred between the Northern and Southern states.” Instead, Coppini proposed to honor those who had fought in the World War, as “all past regional differences have disappeared and we are now one welded nation.” A compromised was reached, and Coppini set out to design the Littlefield Memorial Gateway. Coppini’s intent was to show the reunification of America in World War I after it had been divided in the Civil War. The scheme centered on a 100-foot long rectangular pool of water. At its head, in an elevated pool to create a cascade, was the bow of a ship, on which stood Columbia, symbol of the American spirit. Behind her were representatives of the Army and the Navy. The ship was to be pulled by three sea horses. As Coppini saw it, the fountain group showed a strong, united America sailing across the ocean to protect democracy abroad. Coppini’s original 1919 design for the Littlefield Gateway. Steps on either side of the fountain rose to a small plaza, bounded by two pylons, in front of which stood the statues of Jefferson Davis and Woodrow Wilson. Click on the image for a larger view. Immediately behind the fountain, Coppini created a small plaza bracketed by two large pylons or obelisks, symbolic of the North and the South. In front of each he placed the statues of two “war presidents”: Jefferson Davis, President of the Confederacy at a time when the country was deeply divided, and Woodrow Wilson, leader of a reunified America during the world war. The remaining statues of Lee, Reagan, Johnston and Hogg were staged on either side of the fountain, and were Littlefield’s choices of important men in the history of Texas and the South. The contract was drawn, signed, and accepted by the UT Board of Regents in April 1920. Just in time, as Littlefield’s health was failing badly. He died peacefully the following November, but had anticipated what Brackenridge might do after his passing, and left nothing to chance. His will included $500,000 toward the construction of a new Main Building, $300,000 and land for a women’s dormitory (now the Alice Littlefield dorm), and $250,000 for the Littlefield Gateway, all of which were contingent upon the University staying where it was for the next eight years. 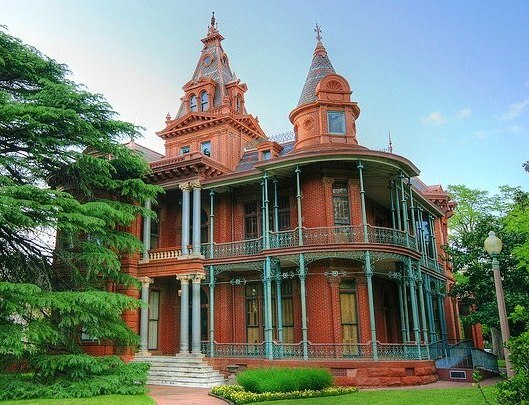 Just hours before he died, Littlefield made one last donation: his Victorian mansion would be turned over to the University subject to Mrs. Littlefield’s life interest. Brackenridge was unprepared for this turn of events. He had hoped to combine Littlefield’s gifts with his own to build a new campus on the banks of the Colorado. With his diminishing assets at just under $1.5 million, Brackenridge would barely be able to make up for the Littlefield donations that would have to be forfeited if the campus moved. Brackenridge fretted, worried about his money, and grew seriously ill. He died in December 1920, just over a month after Littlefield. The debate over whether to move the University campus to the Brackenridge Tract was front-page news in the Austin Daily Statesman for most of the spring of 1921. Despite the setbacks, UT President Robert Vinson, a longtime supporter of Brackenridge’s vision, was unwilling to give up the dream of moving the University to a spacious, riverfront campus. As planned, a bill to relocate the University was submitted to the legislature in January 1921. It received solid support from the regents, Governor Pat Neff, and the local press. But once the bill was read and debate ensued, some legislators saw an opportunity. If the campus were to be moved anyway, why keep it in Austin? One proposal would have allowed any city that could guarantee 500 acres and $10 million to be placed on a ballot, and a statewide election to decide the location. 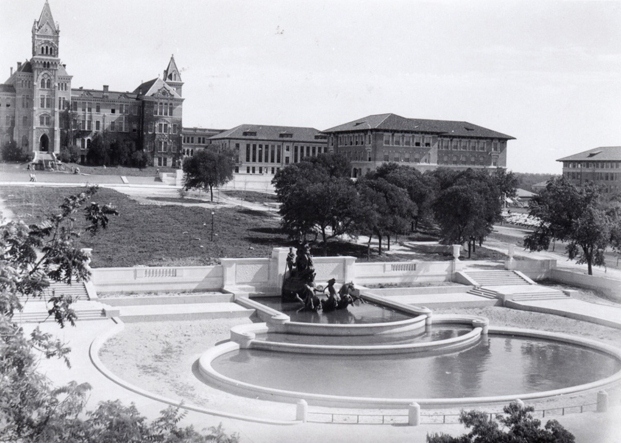 Once the possibility of losing the University became known, the citizens of Austin quickly united against the whole idea, and vilified Vinson for opening a Pandora’s box. The bill to relocate the campus was defeated. Land was purchased east of the Forty Acres, and the campus was extended down the hill to Waller Creek. Littlefield had won. Almost 10 years were required for Coppini to complete the statuary for the Littlefield Gateway. The project was delayed by a bronze workers strike, and cost overruns seriously threatened Coppini’s design. To save money, the regents proposed to strike out the planned obelisks, an idea supported by then UT President Harry Benedict, who thought they would block the view of the old Main Building. Coppini passionately argued that losing the pylons would destroy the intended symbolism, but to no avail. The obelisks were omitted. Photo above: Visitors inspect Coppini’s work at his studio in the 1920s. 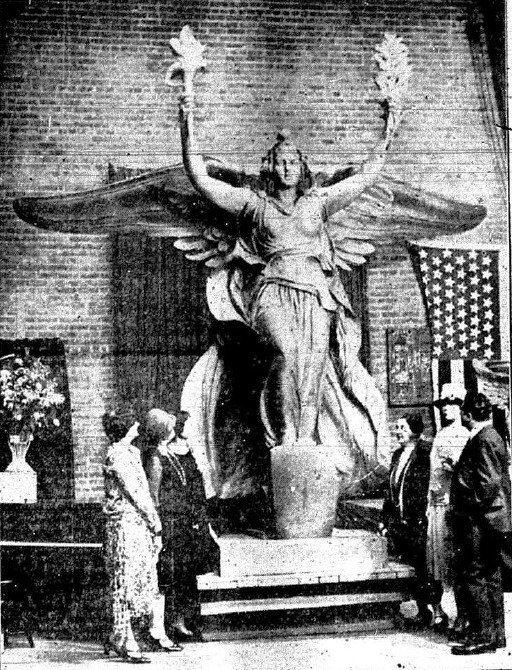 The figure of Columbia, symbol of the American spirit, carries the torch of freedom in her right hand, and the palms of peace in her left. By 1930, most of the statues had been delivered to Austin, and were temporarily on display in the Capitol rotunda. About the same time, the University hired Paul Cret, an architect from Philadelphia, to develop a new campus master plan. Cret was responsible for much of the layout of the campus as it is today. 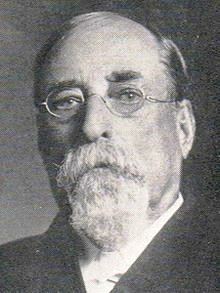 He designed the Main Building and Tower, Texas Union, Mary Gearing Hall, the “six pack” on the South Mall, and many others. The Littlefield Gateway was installed on the campus in 1932 and the fountain activated for the first time in spring of the following year. In this image, just to the right of Old Main, the Geology Building, now the W. C. Hogg Building, is under construction. Cret reviewed the plans for the Littlefield Gateway, and thought the six statues surrounding the fountain were too crowded. To give each figure its own space, Cret spread the statues out along the South Mall, but at the same time hopelessly blurred the symbolism of the Jefferson Davis and Woodrow Wilson figures that Coppini had intended. The fountain was finally constructed in the fall of 1932, and was turned on in March 1933. 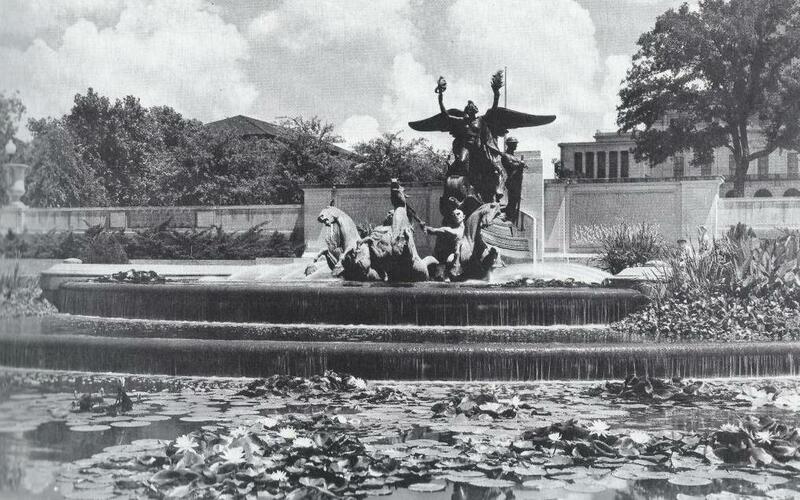 For many years, the Littlefield Fountain contained cattails, lily pads, and other varieties of flowering water plants. Click on image for a larger view. This entry was posted in Uncategorized and tagged Brackenridge, Coppini, Gateway, George Littlefield, Jim Nicar, Pompeo, Robert, Vinson by jimnicar. Bookmark the permalink. Wow! What great stories. Despite passing and pausing at the fountain thousands of times, I’d never realized the extent of its history. What a marvelous monument not only to World War I, but also to two great benefactors of The University. I have read controversies over the statues of Southern historical figures, but did not know the original design of the fountain had the statues located there. Coppini was insightful, realizing that, in the long run, a political balance would be a better image for the University. It is unfortunate that the symbolism was lost by changes to the design, but thank you Mr. Coppini for planning for the future. Now the University claims the fountains too costly to operate. Very sad!